You want a boat load of places to save money? This is it. All the money saving tips you will ever need. 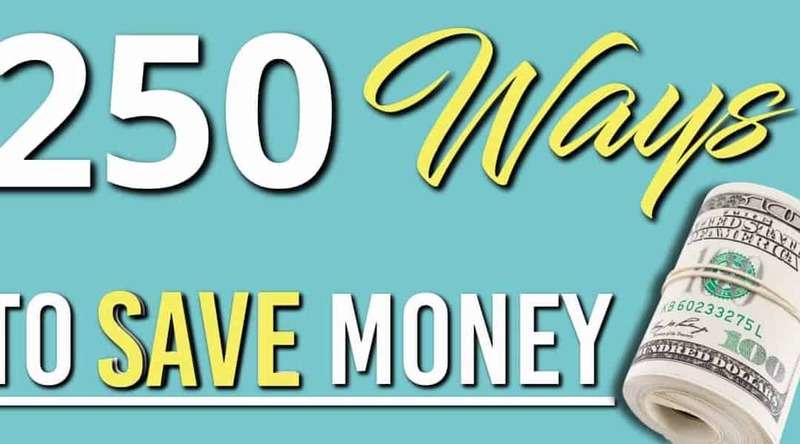 Here is our collection of ideas to save money over 250 ways to save money. If you need to save money, I get it. Here are a lot of ways you can do it. But it’s more about finding what you want to save and where you can do it quickly. 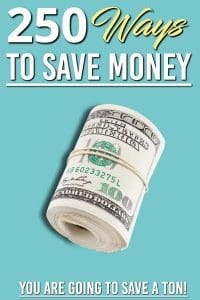 Here are all of our money saving tip posts in one giant list. Swagbucks – another great portal for online shopping, plus they give you $5 bonus to start. Honey – if you shop on Amazon this is a must. It shows the lowest price an item has been so you know if you are over paying . Loyalty Cards – Every place you go to these days seems to have a loyalty card. Sign up for them, and get the discounts. They want to keep you as a customer, these discount are how they do it. Get out of debt. Interest on debt is a silent killer, whether it’s student loans or a car loan or any other type of loan. Pay off your debt faster and you will save money big time! Pay off your mortgage, this is a long term one but you can start to put more money down, if you don’t have any other debt, and it will free up your cash flow. If you have a higher interest rate on your debt, it may be worth refinancing. Check out Lending Tree for your mortgage refinancing and Sofi for your loans. If you are trying to cut your food budget down, then there we have 13 Ways to Save Money on Groceries, or if you are going out to restaurants then here’s 12 ways to Save Money Eating at Restaurants. Of course if you have friends you can always host rather than going out. If you enjoy a beverage or two with your friends, then these 7 Ways to Save Money on Alcohol is a great place to start. Looking for ways to save money on family meals? Here are $25 meals you can do under $5. When it’s cold outside you will wan to read 10 Ways to Save Money on Heating. It’s a must! Have you head of phantom power? What about Led lights, we have these and 18 Ways to Save Money on Electricity this was one of the first places we started to save money. Once you are don with that you can finish up with our 30 Ways to Save Money on Utilities. If you are worried about phantom power you can grab one of these devices. It tells you whether a device is using phantom power so you know to unplug it and can save you money. Ok, kids are expensive, we all know this so here are 9 Ways to Save Money on Kids Clothing. When you are out and about with kids we have another 21 Ways to Save Money with Kids this goes into so many great ideas you have to check it out. Of course if you buy gifts for people over the holidays, these 4 Ways to Save on Christmas Spendingare a life saver. Travelling whether it’s to work, or on a holiday can be expensive! Make sure you are using these 8 Ways to Save Money on Car Expenses.When you travel here are 6 Ways to Save Money on a Family Vacation and if you are renting a car you will want to check out How to Save Money on Rental Cars. Wherever you are you will need these 11 Ways to Save Money on Fuel. They are essential as gas prices keep going up. When it comes to those bigger expense the two biggest factors are to cut your interest rate (check here with Lending Tree for a better rate) and to increase your payment frequency to bi-weekly payments. It can take years off your mortgage. We’re coming up with more and more money saving ideas so bookmark this page and come back to it. There’s more saving ideas to come!